"Jersey Shore" Star Vinny Guadagnino Launching T-Shirt Line! 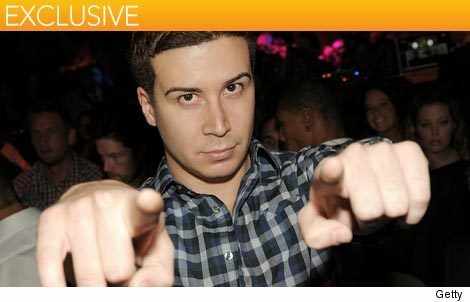 "The Jersey Shore" star Vinny Guadagnino is expanding his empire to include the world of fashion! Next month he's launching a T-shirt line--and it's for a good cause! Guadagnino's T-shirt collection is called "IHAV"--short for "I Have A Vision"--and he's partnering with DoSomething.org to give back a portion of the revenue generated through his first T-shirt design to grants which will help facilitate anti-bullying initiatives across the country. The T-shirt line's launch will be feted at a private reception in lower Manhattan on Monday. DJ Pauly D & Vinny Splurge On Family For Christmas! Buon Appetito! "Jersey Shore" Stars Share Holiday Recipes! Vinny Does Drag for Snooki's B-Day!